The Free and Fair Election Network (FAFEN) held the country-wide sessions with the concerned citizens, stakeholders and students on “Need for Effective Parliament and the Role of Citizens” from August 24 to October 8, 2013 in Khyber Pakhtunkhwa, Punjab and Sindh. Overall, eighteen seminars and ten sessions with students were conducted, including a session with students in Balochistan. The purpose to hold country-wide consultations with the citizens was to reach a consensus on the increased citizens’ interaction with the parliamentarians, create awareness amongst the citizens about their constitutional rights, and gather suggestions to improve the functions of the Parliament. The key objective behind this gigantic effort was to play the role of bridge between the citizens and the parliamentarians, whereby the citizens’ voices could be heard, documented and communicated not only to the higher echelons of policy makers but also to the media and the wider public. The key themes explored improvements in the legislative role/output, transparency/accessibility, participation, responsiveness, parliamentary oversight, order and institutionalization. The concerned citizens also expressed their views on other topics such as the citizens parliamentarians interaction, political parties reform, accountability, electoral reforms, voting process, local government, reserved seats and students unions. The consultative sessions were effective in raising awareness amongst the citizens about the parliamentary functions. They were also used, interactively, to gather the citizens’ recommendations on the parliamentary reforms. Most of the suggestions focused on the legislative role of the Parliament and improving transparency. In terms of improvements in the legislative role, it was suggested that the parliamentarians should focus on lawmaking rather than indulging in the politics of developmental funds in their constituencies. The developmental works are best left to the local government for better service delivery, institutional capacity and governance. Another key suggestion emphasized was strengthening the role of standing committees in the legislative process. In terms of transparency, it was suggested that the recommendations of the standing committees should be shared with the citizens through media. The legislative bills should only be passed in the Parliament after having taken citizens’ views into account. It was also suggested by the citizens, time and again, that television channels should air the proceedings of the Parliament and there should be dedicated parliamentary TV channel set up to do so. Other ways of dissemination of the parliamentary proceedings such as the updated websites, translations in Urdu and regional languages, usage of social media, pring and short-messaging-service (SMS) were also discussed. Another recommendation was made to introduce courses on the Parliament’s function in the curriculum in the educational institutions. It was also emphasized that the parliamentarians should regularly interact with their constituents. They should set up quarterly meeting calendar, maintain offices in their constituencies and hold public hearings. It was felt by the citizens that the parliamentarians’ participation in the legislative process is low and needs to be increased. Similarly, a strong point was made to strengthen the parliamentary oversight of the executive and the enhanced role of the Parliament in monitoring the implementation of laws. For institutionalization, a continuity and perpetuation of the democratic process was recommended that could enable the democracy to have deeper roots in the society. In terms of the role of the citizens, it was felt that constituents generally access the parliamentarians to seek help with their personal matters related to the police and courts rather than focusing on the legislative role of the parliamentarians. Therefore, the citizens also need to improve their expectations as the relationship between the citizens and the parliamentarians is a two way interactive process. The overall mechanism can only improve when a need for enhanced responsibilities is felt on both sides. Under general topics of parliamentary reforms, the concerned citizens emphasized that the expenditure must be controlled in a manner whereby contesting elections is not out of the reach of common citizens. They also recommended political parties to hold their internal party elections. A comprehensive program of voter education and mobilization was advocated to increase the voter turnout. Specific suggestions dealt with installing computerized voting machines at the polling stations and biometric system of vote casting. Other general themes also focused on holding local bodies’ elections, instituting local government and establishing decentralization as the third tier of the government. It was felt that the local bodies’ elections provide more opportunities to women and other marginalized groups. It was also suggested that during the general elections, minorities should be elected through direct elections rather than being selected on the basis of the separate electorate. Lifting of ban on students unions was also strongly recommended as the student unions act as a catalyst in providing new political leadership. A breakthrough during the FAFEN consultations was made when a PPPP Senator from Sindh, Dr Karim Ahmed Khawaja, suggested that he is willing to table a resolution in the Senate for the establishment of a dedicated TV channel to telecast the Parliament’s proceedings live and also to make it possible for the common citizens to watch the proceedings. He also advocated citizens another recommendation that their entry to Parliament should be facilitated. Similarly, a PML-N legislator from Bahawalpur Ms. Sabiha Nazir stated that she would take up the issue of dedicated TV channel to air the parliamentary proceedings. FAFEN would follow up on this offer. FAFEN’s consultations with the concerned citizens covered a wide range of regional, professional, organizational, institutional and gender diversity. Political parties, members of the Parliament, academia, students, government officials, non-governmental organizations, minorities, media, bar councils, chambers of commerce, trade and labor unions were adequately represented during the FAFEN consultations. 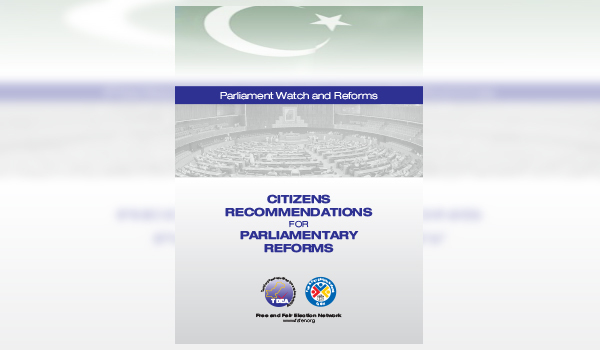 FAFEN received 341 suggestions to improve the governance of the Parliament. FAFEN’s consultations were held in Abbotabad, Peshawar, Kohat, Lakki Marwat, Dera Ismail Khan, Sargodha, Gujranwala, Lahore, Faisalabad, Sahiwal, Bahawalpur, Multan, Dera Ghazi Khan, Sukkur, Dadu, Hyderabad, Karachi and Islamabad. Consultative sessions with students were held in ten universities including Gomal University, Dera Ismail Khan; Bahauddin Zakria University, Multan; Islamia University, Bahawalpur; Sardar Bahadur Khan University, Quetta; Federal Urdu University, Islamabad; University of Peshawar; University of Karachi; Preston University, Islamabad; Quaid-e-Azam University, Islamabad; and University of Punjab, Lahore.